The Wall Street Journal yearly indexes the outcome of the economic performance of each country globally. Eritrea truly started to be indexed starting 2009 the year the country start exploring gold. Here is the extrapolated and compared Eritrea with the rest of Ethiopia in performance graphically from this resource of Heritage Foundation. 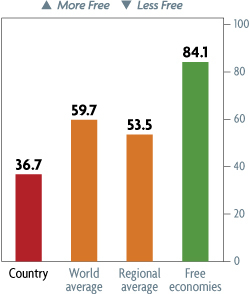 Eritrea’s economic freedom score is 36.7, making its economy one of the least free in the 2011 Index. Its overall score is 1.4 points higher than last year, reflecting some improvements in its ratings for government spending, business freedom, and labor freedom. Eritrea is ranked 45th out of the 46 countries in the Sub-Saharan Africa region. Ethiopia’s economic freedom score is 50.5, making its economy the 144th freest in the 2011 Index. Its overall score is 0.7 point lower than last year, reflecting declines in four of the 10 economic freedoms that were partially offset by gains elsewhere. Ethiopia is ranked 30th out of 46 countries in the Sub-Saharan Africa region, and its overall score is just below the regional average. Eritreans have suffered substantial losses of economic freedom in recent years. Afflicted by poor economic management and structural problems that severely undermine private-sector development, the country lags in productivity growth and dynamism and, consequently, in economic growth as well. Long-standing structural problems include poor public finance management and underdeveloped legal and regulatory frameworks. Poor governance and the lack of commitment to structural reforms continue to hamper economic freedom. Investment freedom, financial freedom, property rights, and freedom from corruption are extraordinarily weak. Monetary stability remains fragile, and inflation is very high, largely reflecting excessive money creation to fund fiscal deficits. Arbitrary taxation, poor infrastructure, marginal enforcement of property rights, and weak rule of law have driven many people and enterprises into the informal sector. 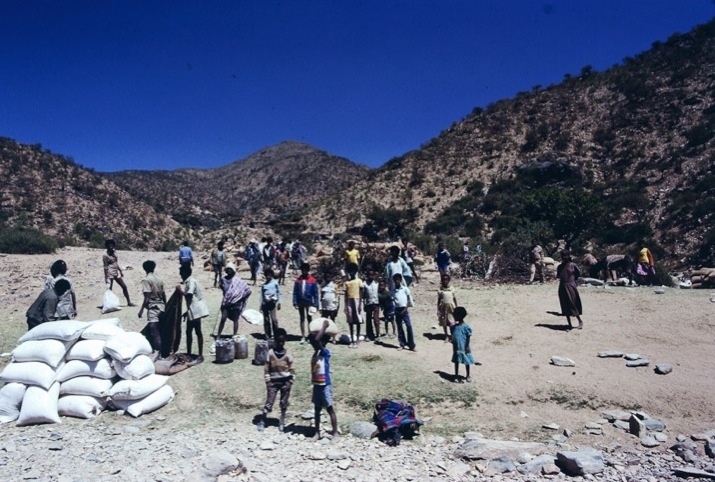 ree-quarters of Eritreans depend on small-scale agriculture and fishing, and two-thirds of the population receives food aid. Productivity is very low, and the International Monetary Fund estimates that remittances from Eritreans living overseas were equivalent to 23 percent of GDP in 2007. Existing regulations are severely outdated and not conducive to entrepreneurial activity. Procedures for establishing and running a business are opaque and costly. Eritrea’s weighted average tariff rate was 5.4 percent in 2006. Import licensing for all private imports, inadequate infrastructure, inefficient and cumbersome customs administration, weak protection and enforcement of intellectual property rights, corruption, and limited export activity delay trade and increase its costs. Twenty points were deducted from Eritrea’s trade freedom score to account for non-tariff barriers. Inflation has been out of control, averaging 28.8 percent between 2007 and 2009. The government uses the military and party-owned businesses to implement its development agenda and strictly controls the use of foreign currency. Few private enterprises remain. The diversion of manpower and government funds away from peacetime economic activities is expected to continue. Twenty points were deducted from Eritrea’s monetary freedom score to account for extreme monetary-control measures. Eritrea remains a strict command economy, eliminating most private investment. Large-scale projects must be approved by the appropriate minister or the Office of the President. The government has selectively and narrowly courted foreign investors to explore underexploited resources in mineral extraction, energy, fisheries, and tourism. Regulatory procedures are haphazard and irregularly enforced. Additional impediments to both domestic and foreign private investment include severe limits on the possession and exchange of foreign currency, lack of objective dispute settlement, difficulty in obtaining licenses, large-scale use of conscripted labor, and expropriation of private assets. Government influence makes the courts biased arbiters in legal disputes. Eritrea’s financial system remains poorly developed, and government interference is significant. High credit costs and scarce access to financing severely impede private investment and economic growth. All banks are majority-owned by the state, and private-sector involvement in the financial system remains limited. The Commercial Bank of Eritrea, the largest commercial bank, is chartered by the government to provide a range of financial services to the public, but very high collateral requirements for loans prohibit many small entrepreneurs from establishing and expanding their businesses. The government has borrowed heavily from private banks, crowding out private-sector economic activity. Falling interest rates have destabilized banks and led to a further decline in financial intermediation. The government strictly controls the political, social, and economic systems. The independence of the judiciary is limited. The government has a history of expropriating houses, businesses, and other private property without notice, explanation, or compensation. Arbitrary and complex regulatory requirements discourage investment from both foreign and domestic sources, and the government often reclaims successful private enterprises and property. In theory, women have the legal right to equal educational opportunities, equal pay for equal work, and equal property rights; in practice, men retain privileged access to education, employment, and control of economic resources, particularly in rural areas. “To prevent Eritrea from becoming the Horn of Africa’s next failed state “. This is Report in contradiction with different international analysis given to the definition of failed state to this day. Furthermore, the report failed to give the definition and deference between failed and siege states. It rather enumerated historical chronology of events than defining the dynamics of a failed or regime in siege. The paper lucks a conceptual and methodological frame work or a research approach to a failed state. The ICG report further accused the Ethiopian regime as a responsible and not Eritrea for the Somalian crisis as a traditional enemy contradicting to the recent UN sanction. ICG recognized Eritrean support for the proxy warriors of the region from Somalia up unto Darfur passing by Ethiopia. The Report in term failed to make the real comparison between the two failed states since both countries are preparing proxies against each other and by extension in Somalia. They preferred to fight via proxy in Somalia than in Bademe, Asmara, and Mekele etc… The UN sanction would have been imposed on both failed sates of the Horn of Africa not only Eritrea. Since both uses Somalia as their battle ground for proxy wars. ICG affirmed that the recent Gold Bonanza of Eritrea will strengthen her 20 years radical line of action in domestic and regional polices. I think we have to wait rather than making a precipitated prediction, since “one who laughs last laughs the best,” when it comes to the Horn of Africa. It is expected a full reversement of relation in the region even between Addis and Asmara in the very short foreseeable future. Since it is very easy to make peace with once friend today’s enemy rather than acquire a new one in the complex socio political situation of the Horn of Africa. The International Crisis Group (ICG) in its Report N°153, 4 Sep 2009 has well demonstrated the Ethiopian regime’s Ethnic Federalism and its decentralized state. Its Report N°141 of 17 Jun 2008 was pertinence to the point by demonstrating the fragile peace between Eritrea and Ethiopia with a risk to a new confrontation. The report further affirmed that their No Peace No War situation is a major source of instability for Somalia as demonstrated with that of Ethiopia’s refusal to accept virtual demarcation, and affirming that Asmara’s unilateral implantation would shatter the status quo. This last assessment was proved wrong; despite to the ICG’s 2 years old report the conflict did not spark Scaramouch leading to war to this day. We think that ICG’s in the future has to make an objective report without making impartiality between the Horn of Africa’s belligerent failed states. These failed states of the Horn act like they have a hidden red telephone between the two discussing the arts and the techniques how to maintain each other in their respective power via proxy war in Somalia. IF a new public dialog between the two is struck, the next day the Somali proxy war will end. They are the instigator of the 20 years of crisis one way or another, Somalia has been a stateless since they came to power almost two decades ago. When you see Eritrean leaders you have seen Ethiopian leaders, since they are the opposite faces of the same coin. Any foreseeable analyses to make a reasonable prediction about these two failed states is not an easy task using traditional simplistic journalistic affirmations, which are generally hasty and full of highlight and short of any substance. And it is not that simple to grasp or understand the internal dynamics of the horn of Africa’s politics to engage oneself to make any reasonable futuristic prediction. Please read the different Report on Eritrea and Ethiopia and make your comment directly to the group. Is Eritrean policy shift just “tactical”? To prevent Eritrea from becoming the Horn of Africa’s next failed state, the international community must engage more with the country. 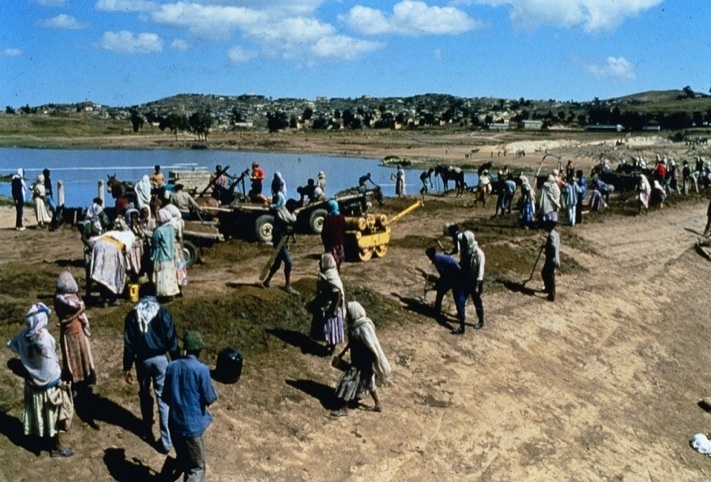 Eritrea: The Siege State , the latest report from the International Crisis Group, analyses the fragile political and economic situation following the devastating war with Ethiopia (1998-2000). Just a decade ago, Eritrea might reasonably have been described as challenged but stable. Today it is under severe stress, if not yet in full-blown crisis. While not likely to undergo dramatic upheaval in the near future, it is weakening steadily. Its economy is in free fall, poverty is rife, and the authoritarian political system is haemorrhaging its legitimacy. “As Eritrea continues on this trajectory, its current economic and political problems are only going to deepen”, says Andrew Stroehlein, Crisis Group’s Director of Communications. “While there is no open protest at the moment, the government cannot take this for granted over the long term. Change is really only a matter of time”. The militarism and authoritarianism which now define Eritrea’s political culture have their roots in the region’s violent history. The 30-year war for independence – achieved in 1991 – was part of a network of conflicts which devastated north-east Africa. The real significance of that legacy has only become clear in the last decade, as President Isaias Afwerki and a small cohort of ex-fighters have strengthened their grip on power, while suppressing social freedoms in favour of an agenda centred on an obedient national unity and the notion that Eritrea is surrounded by enemies. Eritrea has fought in recent years, directly or indirectly, with Ethiopia, Yemen, Djibouti and Sudan and involved itself in various ways in the conflicts in eastern Sudan, Darfur and Somalia. 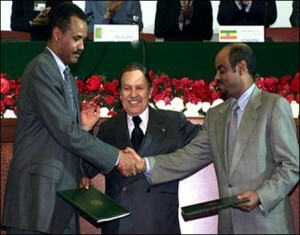 Relations with Ethiopia in particular remain extremely tense, in large part because Ethiopia has failed to abide by its Algiers Peace Agreement commitment to accept binding arbitration on their disputed border. (The boundary commission ruled that the town of Badme – the original flashpoint of the war – was in Eritrea.) The UN Security Council’s failure to compel compliance reinforced the sense in Asmara that the international community is inherently hostile. While Eritrea asserts that it is pursuing legitimate national security interests, its aggressive approach and abrasive tone have left it increasingly isolated. The army has been the key stabilising force, but it is becoming less stable, riddled with corruption and increasingly weak. National service – originally intended to build the country – could well prove one of the catalysts for the regime’s eventual collapse. Some form of demobilisation is required but cannot happen overnight, as society and the economy are incapable of immediately absorbing tens of thousand former soldiers. A holistic approach is urgently needed and requires outside help. Instead of pushing the regime into a corner, the international community should engage with Eritrea on the basis of a greater understanding about the country’s past and current grievances. This might well remove one of the regime’s key rationales and ultimately empower more reform-minded and outward-looking elements within the ruling People’s Front for Democracy and Justice (PFDJ) and wider society. “It is inadequate and unhelpful simply to portray Eritrea as the regional spoiler”, says Ernst Jan Hogendoorn, Crisis Group’s acting Africa Program Director. “It is also the product of the political environment of the Horn as a whole. Ultimately, everything is interconnected, and a more comprehensive, integrated approach is needed by the international community to treat the severe problems confronting Eritrea and the region”. New Report- Cameroon: Fragile State? After trying to fight off accusations on supporting terrorist organizations in Somalia, the Eritrean government is now facing accusations over involvement in a bomb attack that took place in Ethiopia. While at first sight the bomb attack may seem like an unlikely act of Eritrea, some deeper investigation connects the bomb attack to recent military actions taken by Eritrean rebel groups against Eritrean military bases. The bombing turns out to be a potential retaliation for the attacks these rebel groups may have staged from Ethiopian territory. This news draws attention to the continuing struggle of Eritrean opposition movements to end the ruthless regime of President Isaias Afewerki and install a democratic government in the country. While Eritrean President Afewerki has been receiving German members of parliament to uphold a good image of his government in an attempt to lift sanctions imposed upon his country, the Eritrean opposition movements remain active and continuously reach closer forms of cooperation. Eritrea is known to uphold a ruthless oppressive regime that allows to political opposition and it acts upon this with kidnappings, imprisonments and torture. 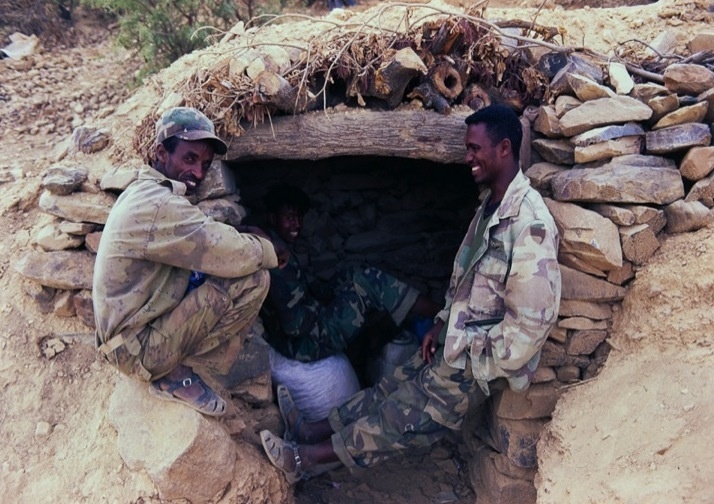 Last Thursday two Eritrean rebel groups launched assaults against Eritrean military intelligence bases located on an axis trailing back to the Ethiopian town of Adi Dairo, where Eritrean rebel groups are known to operate. 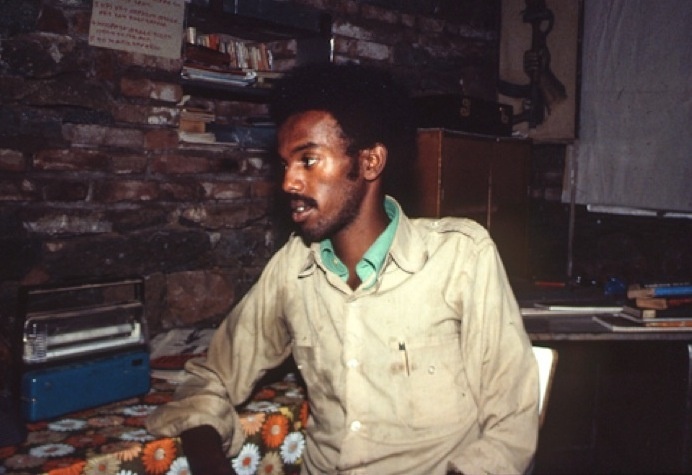 On Saturday an explosive device exploded in a café in Adi Dairo, the bombing is likely to be the work of Eritrean intelligence agents retaliating for the rebel assaults on its military bases. While fighting opposition and sanctions the Eritrean government does find comfort in the gold rush that currently takes place in its country. This gold mining industry may deliver the resources President Afewerki requires to keep his regime in control of his country. Two weeks ago President Isaias Afewerki of Eritrea was visited by German members of parliament. He talked to them about bilateral relations between Germany and Eritrea, as well as Eritrea’s relations with different countries in the region. There is no doubt that Isaias’ goal was to convince the German members of parliament that the government of Eritrea is not supporting rebels in neighboring countries, or smuggling weapons to them for that matter. Several agreements concerning the health sector were reportedly made, but the key lesson to learn from this visit is that Eritrea is suffering from the sanctions put on it, and that its President is now forced to make diplomatic tours to raise support of Eritrea in western countries. Eritrea is trying to fight off the outside pressure on its regime, while at the same time the pressure from within keeps on building. Opposition groups and rebels continue to try and put an end to Afewerki’s rule. In Eritrea the only political party allowed by law is the People’s Front for Democracy and Justice, the party of the currently ruling President Isaias Afewerki. As no legal opposition parties are allowed the opposition movements are usually located in neighboring Ethiopia or elsewhere abroad. Most opposition groups such as the Eritrean Liberation Front, the Eritrean Democratic Party, the Eritrean National Salvation Front and the Eritrean Islamic Reform are cooperating under the EDA, the Eritrean Democratic Alliance. The group doesn’t only contain political councils aimed at creating a new democratic regime in Asmara, it also contains rebel groups such as RSADO which occasionally launch military operations against the Eritrean military. The Eritrean opposition has only been uniting since around 2004, and presents the largest opposition movement Afewerki has had to face so far. Of course these six last years are a significant share of Eritrea’s independent history that only started in 1993. Eritrea has been oppressing these opposition movements since the beginning of the Afewerki regime. Not only are they forbidden to exist, let alone take part in elections if President Afewerki were to ever organize such elections, the Eritrean government has made a habit of using violence against any political diversity. Political leaders, even from Afewerki’s own party, that don’t align with Afewerki’s regime are kidnapped, imprisoned and at times even left to die in jail. Reports of torture and false accusations to imprison opposition members have regularly surfaced. The Eritrean government also limits any outsiders to confirm these facts by seriously limiting travel of foreign officials and even its own citizens. 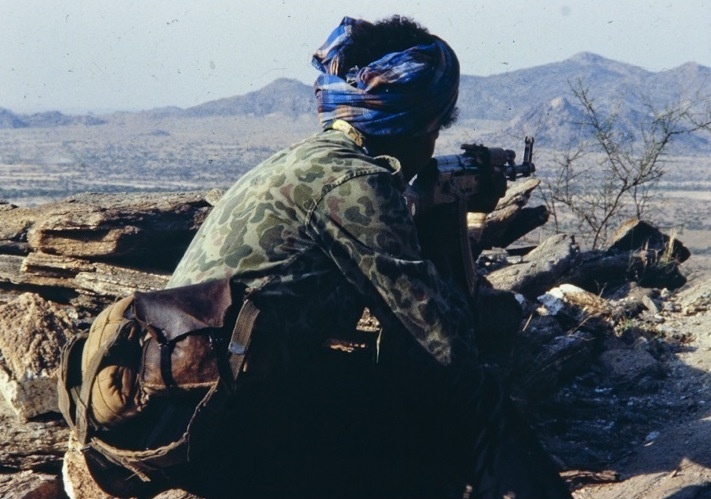 On Thursday April 22nd two rebel movements; RSADO (Red Sea Affairs Democratic Organization) and the Eritrean National Salvation Front, both movements part of the Eritrean Democratic Alliance, mounted a joint assault on different military bases in southern Eritrea. The assault reportedly targeted military intelligence forces tasked with guarding the Eritrean border from Ethiopia as well as keeping tabs on these rebel forces. The rebels claim to have assaulted the bases in Adi Mesgena, Hadush Adi and Tselim Kelay during nightfall, routing the present Eritrean troops. After holding the bases to destroy and harvest equipment and intelligence located in these bases they were vacated by the Eritrean rebels. As the map shows the assaults took place in two distinct regions, raising the possibility that both pushes originated from the same point located within Ethiopia. The rebels claim to have killed between 11 to 17 members of the Eritrean military, part of the unit tasked with intelligence operations. On Saturday April 24th news surfaced from Ethiopia that explosives had been set off at a café in Adi Dairo, a town near the Eritrean border. Ethiopia was quick to claim the activity of Eritrean intelligence agents trying to destabilize Ethiopia ahead of the elections. It is however unlikely that the bomb attack had anything to do with the upcoming elections in Ethiopia. 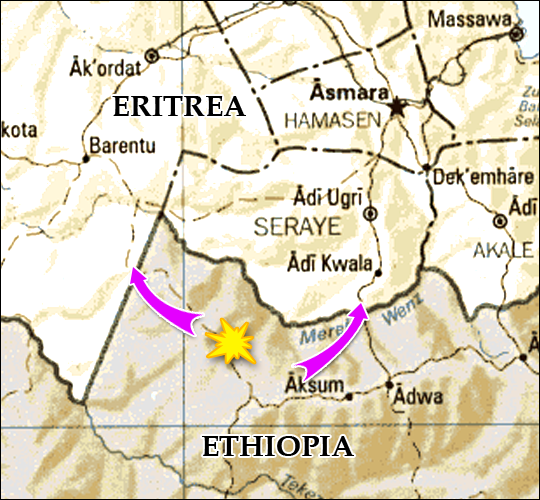 As shown on the map the location of the bombing is situated right between Thursday’s rebel assaults on Eritrean military bases, located on the main road connecting both angles of assault. Ethiopian officials have also disclosed that the town of Adi Dairo is known to host activity of Eritrean armed rebel groups. It is very likely that the assaults on the Eritrean military bases were organized in Adi Dairo and that the bombing was a retaliation for the assaults by the Eritrean intelligence troops. While the Eritrean Democratic Alliance refuses any overt help from Ethiopia to overthrow President Afewerki, it is known that these forces are operating out of Ethiopian territory and Eritrean retaliations on Ethiopian soil could severely stress the already hostile relations between the two countries. While President Afewerki faces opposition attempts to overthrow his regime and install a democratic rule instead and faces international sanctions against his country at the same time, there is a last glitter of hope that Afewerki’s government hopes will bring the resources needed to keep the regime in power. A very real gold rush is currently taking place in Eritrea. The so far barely tapped gold deposits in the country are being exploited by international companies. As opposed to other countries, the Eritrean government does not demand a majority stake in the mining operations, instead it reportedly demands only a ten percent share in the operations, which makes mining in Eritrea considerably more profiting to these foreign companies. Opposed to this stands of course the security risk of operating in Eritrea, not only the rebel groups and the continuous fear of a border war with Djibouti or Ethiopia present a security risk to mining companies. Also the government itself presents a security risk at times. The Eritrean government does not allow companies to do their own hiring of personnel to work in the mines, instead the government delivers workers, usually conscripts in the Eritrean military, to perform slave labor in these mines. Eritrea has been ruthless in forcing out other personnel and citizens wandering around mines, causing tensions and killings at mine operations. The income of the gold mining operations might, however, result in the necessary resources that Afewerki requires to keep his regime in control of his country. The author of this article excuses himself for a mistake in the original version of the article. The author had wrongfuly understood that President Isaias Afewerki had visited the German members of parliament at their home in Germany, in fact the German members of parliament visited the president in Eritrea. April, 25, 2010 (ADDIS ABABA) — A bomb blast at a crowded Snack bar in Ethiopia’s northern region of Tigray on Saturday killed 5 people and injured 20 others. Ethiopian officials have held the Eritrean government responsible for the attacks, which they said was aimed to disrupt country’s upcoming national elections. 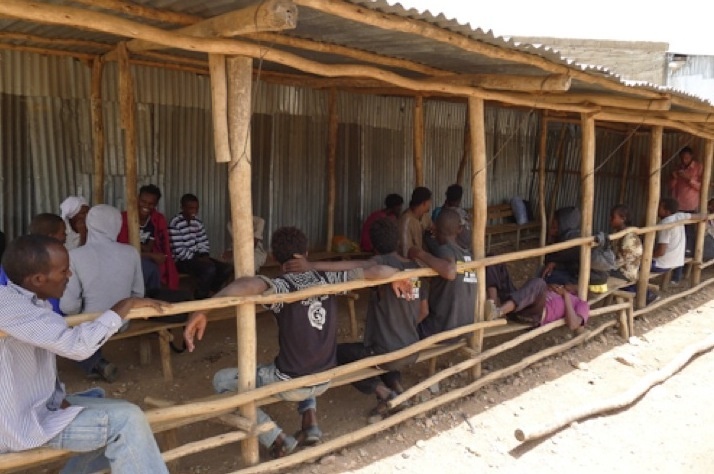 The attacks in a border town of Adi-Daero occurred one day after two Eritrean rebel groups claim carrying-out a joint attack at military camps inside the red sea nation that killed at least 18 Eritrean intelligence agents. Tigray regional president, Tsegay Berhe, told state owned news agency that the latest attacks are part of Asmara Government’s evil conspiracies aimed to disrupt country’s upcoming national election. Tsegay stressed that “such attacks by no means would disrupt the scheduled elections,” he convoyed messages of condolences. Some 32 million Ethiopians will go to polls next month. Around 200 people died in post-election violence five years ago sparked by accusations that the ruling-EPRDF party had rigged the ballot. Regional police investigator who is unauthorized to give statement, in a condition of anonymity confirmed Sudan tribune that arrests of some suspects being made but declined to give in numbers and also refused to comment if perpetrators were Eritrea government-hired Ethiopians or Eritrean citizens. He said investigation is well underway. Reached by phone, a local journalist-Kidane Mariam, from the spot said that the bombs used in the attacks are unusual and very powerful. “Such well-coordinated attack is sure an Eritrean government conspiracy,” he said echoing the official position. Ethiopia and Eritrea remain in a no-war no-peace condition after the two neighbors in 1998-2000 went into a border war that killed an estimated 70,000 people. Ethiopia has long hold Eritrea responsible for a number of bomb attacks in its soil, something Eritrea denies. Addis Ababa, March 29 (WIC) –The newly assigned Yemeni ambassador to Ethiopia Dirham A. Noman said the international community should put additional pressure on Eritrea over its destabilizing role in the Horn of Africa. In an exclusive interview with WIC, ambassador Noman said the recent sanctions imposed on Eritrea by the Security Council over its role in Somalia and refusal to withdraw troops from Djibouti were appropriate. He said the international community should put effective pressure on Eritrea as it has chosen to continue with its role as a spoiler of peace in the region. The ambassador further said Ethiopia and Yemen are working more closely with the international community to restore peace in Somalia and bring about rapid economic growth at the entire Horn of Africa. Commending the recent peace agreement reached between the Transitional Federal Government (TFG) of Somalia and opposition groups, ambassador Noman said Somalis themselves need to work for the success of the peace process in their country. He further said Yemen would continue to work with Ethiopia and other peace loving countries in order to create a stable and safe Somalia as well as Horn of Africa. The ambassador further said in addition to hosting Somali refugees, his government is training the Somali police force as well as providing financial and other support to stabilize the country. Afar Ethiopia vis Ertrea, Who is Attacking Who? Pretext or a Proxy War ? Eritrea ruler’s propaganda website, www.shabait.com , today reported of a deadly border clash with Ethiopian troops in the early hours of the first day of the new year 2010. The incident reportedly took place in the border town of Zalambesa. “Zalambesa, 2 January 2010: In the early morning hours of January 1st 2010, TPLF soldiers launched successive attacks in the Zalambesa front and were swiftly driven back with 10 of their soldiers killed and two captured, leaving six AK-47 automatic rifles, a machinegun and communication equipments” said the report posted on the front page of the website. Addis Ababa – Eritrea accused arch-foe Ethiopia on Sunday of launching attacks along their disputed border but said its troops had driven off the assault, killing 10 Ethiopian soldiers and capturing two. The Eritrean foreign affairs ministry said soldiers from Ethiopia’s ruling Tigrai People’s Liberation Front (TPLF) had attacked on Friday in the Zalambesa area. Ethiopian officials were not immediately available for comment. “In the early morning hours of January 1st 2010, TPLF soldiers launched successive attacks in the Zalambesa front and were swiftly driven back,” the ministry said in a statement on its website. 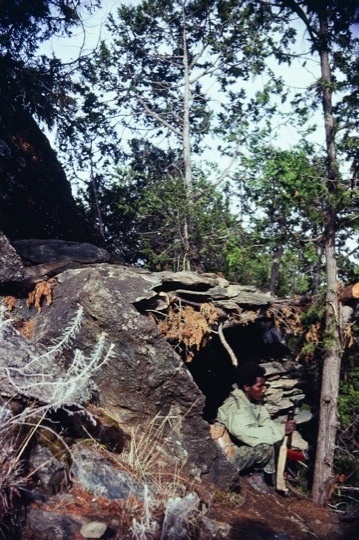 Zalambesa lies in the centre of the contested frontier, over which neighbours fought a brutal war in the late 1990s. “Ten of their soldiers (were) killed and two captured, leaving six AK-47 automatic rifles, a machine gun and communication equipment,” the statement said. Ethiopian Prime Minister Meles Zenawi’s TPLF party is the main member of the ruling coalition and was a close ally of the Eritrean government before they fell out prior to the border war. About 80 000 people died in the 1998-2000 border conflict, many in brutal World War I-style trench warfare. A UN-backed boundary commission charged with demarcating the border has handed the disputed town of Badme to Eritrea but Addis Ababa has refused to recognise the ruling. In August the Hague-based Eritrea-Ethiopia Claims Commission ordered Asmara to pay $10m in damages sustained during the conflict, a decision Asmara has pledged to comply with. Addis Ababa – An Eritrean opposition group told AFP on Tuesday it was “prepared to launch attacks” on government troops after the United Nations last week imposed tough sanctions on Asmara. “This is a good opportunity for us,” Cornelios Osman, head of the Democratic Movement for the Liberation of the Eritrean Kunama (DMLEK) said in a phone interview. The UN Security Council last week voted for an arms embargo and targeted sanctions against Eritrea, which has been accused of trying to destablise the Western-backed government in neighbouring Somalia. Asmara condemned the decision as “a shameful day” for the United Nations. But Cornelios said the travel ban imposed on senior officials would “further isolate the regime” and “deter it from receiving the hundreds of millions of dollars it gets” annually from the Eritrean diaspora. DMLEK is a member of the Ethiopia based coalition Eritrean Democratic Alliance, of which two other groups have also waged a nascent armed struggle often staging hit-and-run attacks. Eritrean President Issaias Afeworki has often dismissed his country’s foreign-based opposition as “puppets” linked with arch-foe Ethiopia, with whom Eritrea recently fought a border war. Some 80 000 people died in a 1998-2000 border conflict between the two neighbours, many in brutal World War I style trench warfare. A UN-backed boundary commission charged with demarcating the border handed the disputed town of Badme to Eritrea but Ethiopia has refused to implement the ruling so far. Thursday 31 December 2009 03:32. December 30, 2009 (MEKELLE, ETHIOPIA) – Ethiopia on Wednesday told Sudan that arch-foe Eritrea is being prepared to use Sudanese territories for “terrorism” missions. Speaking at the ongoing 12th Ethio-Sudan border development commission meeting in the northern Mekelle town, director for National Security and Intelligence Service, Getachew Assefa urged the joint commission to seriously look into Eritrea’s intention. “According to our latest intelligence sources, the Eritrean government is making all the necessary preparations to use the long Ethiopia-Sudan common border to smuggle ‘terrorists’ and anti-Ethiopian forces into to our soil” said the director, also the representative of the Federal Democratic Republic of Ethiopia to the joint commission. “It is imperative, therefore, for the joint border commission and the respective bordering states of both countries to clearly understand the intentions of the Eritrean government.” He added. The Ethiopian official further said that his government is closely watching into what he said was “Asmara’s systematic gamble aimed to disrupt the existing excellent ties between Ethiopia and Sudan”. Last week, Ethiopian authorities said that they have apprehended four individuals with “Eritrean accent” who are suspected of carrying out a recent deadly grenade attack at a packed café in the restive Ogaden region where terrorist-designated Ogaden Rebels (ONLF) are active. Sudanese presidential advisor and head of the Sudanese delegation General Salah Abdalla to his part said that securing peace and stability in either of the neighbours does mean securing peace to both countries and expressed his country’s readiness to fully cooperate with Ethiopia for regional peace and security. General Salah Abdalla hailed Ethiopia’s relentless efforts to bring peace and stability in Sudan. The Ethiopia-Sudan border development commission meeting is expected to end tomorrow passing important cooperation agreements based on evaluations commission studied on past implementation performance. The four-day joint meeting deliberates on matters of security, education, trade, health, culture, control of illegal border trade and also on ways of preventing communicable diseases among others. The republic of Sudan has sent a 135-member Sudanese delegation including a musical team from Upper Nile, Blue Nile, Sener, and Geddarrif states.On the Ethiopian side, Tigray, Benishangul-Gumuz, Amhara and Gambella are the States representing Ethiopia. Ethiopia and Sudan will fight against Eritrea’s attempts to arm insurgents to destabilize the two East African nations heading for elections in 2010 around their common borders, a senior Ethiopian security official said on Wednesday. Ethiopia’s top spymaster, Getachew Assefa, the Director-General of the National Intelligence and Security Services, said the border security was of utmost importance for the two countries as they prepare for presidential and parliamentary elections in 2010. He said the elections in the two countries provided a ‘golden opportunity’ to the Eritrean government to stage attacks against Ethiopia. The Ethiopian diplomats and security experts have been holding talks with their Sudanese counterparts in Mekelle town, some 900 kms north of capital Addis Ababa, on matters of mutual interest, covering border security and political stability. The 12th session of the Ethiopian-Sudanese Development and Boundary Commission resolved to step up border security, warning that the next-door neighbour, Eritrea, was likely to use the border areas to cause political tensions in the two countries. Sudan and Ethiopia, which have been holding the Joint Commission meeting in the region near Eritrea since 28 December, said the fight against terrorism would top their agenda as the two states head towards elections in 2010. Sudan’s electoral process is underway with Presidential nominations expected to take place on 22 January, while Ethiopia’s parliamentary polls are due to be held on 23 May, 2010, in which the party with the majority seats in parliament forms the government. Eritrea has been put under strict UN Security Council sanctions for allegedly supplying arms to insurgents battling to overthrow the western-backed Somali interim government and for its military aggression against neighbouring Djibouti. Assefa warned that the Eritrean government was preparing to use the Sudanese territory as a base to arm insurgents and launch terrorist attacks against Eritrea, according to state media reports, which quoted the Ethiopian official, urging joint security operations. Sudan’s Presidential Advisor General Salah Abdella said the two states were working together to scatter any terrorist attempts in the region. Abdella said the two states would work closely in monitoring the border and fighting terrorism. Eritrea has denied the accusations levelled against it by the Ethiopian government, saying the UN sanctions were based on falsified reports. ZALAM BESA, Ethiopia (Reuters) – Two Eritrean rebel groups said on Friday they have killed 25 government soldiers and wounded at least 38 others, in ambushes on two military camps. There was no immediate comment from the Eritrean government and the report could not be independently confirmed. Rebel spokesman Yasin Mohamed said the attacks by the Red Sea Afar Democratic Organisation (RSADO) and the Eritrean Salvation Front (ESF) rebels were in retaliation for the repression of the Afar minority and others by the government. “The joint forces earlier today, made a surprise attack at the camp of 13 sub-division of the 2nd brigade at the vicinity of Kokobay, killed 13 and wounded 20 others,” Yasin said. He said a separate attack killed 12 members of an intelligence unit and wounded 18 others in Kermeti area. The United Nations Security Council imposed sanctions on Eritrea last week for arming and supporting Islamist insurgents in Somalia.